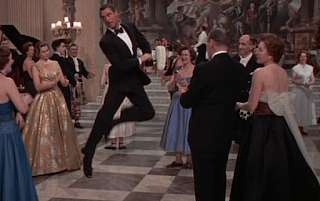 A luscious romance with a sprinkling of comedy, Indiscreet celebrates authentic love but has passages of drift as it sets up a farce-like finale. Anna Kalman (Ingrid Bergman) is a celebrated stage actress based in London, successful in her career but unlucky in love. Her sister Margaret (Phyllis Calvert) and brother-in-law Alfred (Cecil Parker) urge her to be less picky about men, but Anna is close to giving up on finding the love of her life. She then meets the highly cultivated international finance expert Philip Adams (Cary Grant). A romance blossoms between them, although Philip warns her early on that he is married but separated from his wife and unable to get a divorce. Philip secures a job with NATO in Paris and travels to London every weekend to spend time with Anna, who stars in a new hit show on the London stage. She accepts that although they are deeply in love, Philip can never marry her. But all is not quite as it seems, and the relationship is headed into severe turmoil that will require Anna to improvise a new performance. Based on the comedy play Kind Sir by Norman Krasna, Indiscreet starts out as a pure romance and ends in close-to-slapstick territory. In between, the film endures an awkward patch as the plot waits for something - anything - to happen. Once the relationship between Anna and Philip settles down, the script (also by Krasna) gives director Stanley Donen plenty of time to kill, and momentum is lost as the lovers circulate around already-explored territory. That some forward motion is maintained is thanks to Grant and Bergman, two stars in top form displaying the silky skills of gliding veterans. Despite their age difference (Grant was 54 in 1958, Bergman 43), the chemistry between them is rich and immediate, as two adults recognize in each other a potential life-long partner after years of false starts and disappointments. 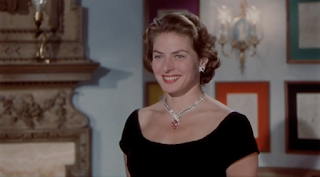 Indiscreet is filled with beautiful people wearing beautiful gowns and going to beautiful places. From Anna's glorious apartment to the exclusive club where Anna and Philip dine, there are no characters in this movie who are not stars or diplomats or otherwise wardrobe challenged. London as a playground for the rich and influential provides the romantic backdrop. However, on a couple of occasions, the rush to break the film away from its stage origins results in unresolved awkwardness, with some outdoor scenes existing seemingly purely for the sake of leaving the soundstage. 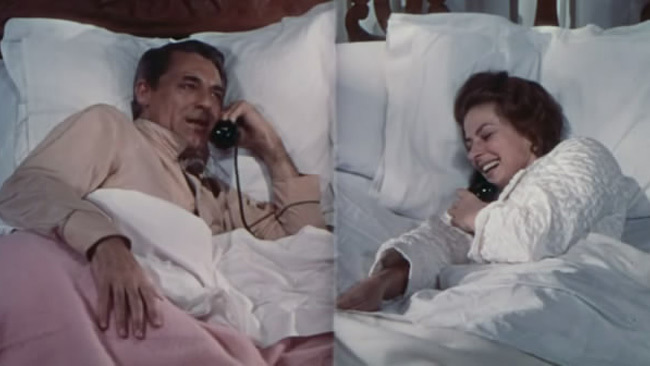 But Donen also adds some exceptionally clever visual touches, an intimate lovers' phone call between Anna in her London bed and Philip in his Paris bed a particular highlight. Indiscreet does ask some interesting questions about what some women hope to gain from entering into a relationship with an ultimately unavailable man, and why some men avoid long-term commitments at all costs. Thanks to the central plot twist, the answers are abandoned in favour of a final act that veers towards broad comedy, the flames of fake jealousy farcically fanned to test the mettle of the relationship, complete with a dance floor number allowing Grant to demonstrate terrific athleticism, oblivious to Bergman's pointy passive aggressiveness. Indiscreet or not, love can also be the source of campy humour, even among the glamorous set of stage stars and international financiers.